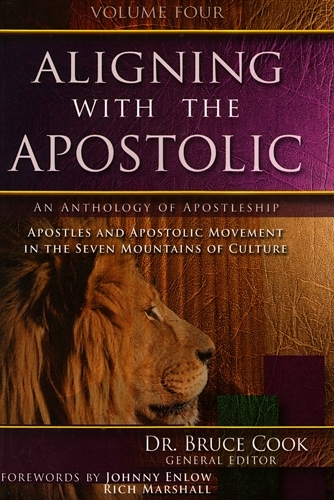 Book Four of a five volume anthology of apostleship with 70 contributing authors. Chapter 49: Building Bridges for Kingdom Advancement – Dr. Carl white, Jr.
Chapter 57: The Art of Faith – Max Greiner, Jr.
Aligning With the Apostolic is much more exhaustive than previous books on apostolic ministry. The next generation of ministers will have a greater revelation of this important ministry because of the contributions of these authors. I highly recommend these volumes, and believe they will contribute to the increasing knowledge of the importance of apostles and apostolic ministries. Dr. Bruce Cook has done an excellent job in gathering many of the greatest apostolic voices of our day, and I believe it will cause many in the church to have a new level of faith and boldness to advance the kingdom of God in generations to come. Get ready to move ahead with revelation and understanding to see breakthroughs in society. God is able to do exceedingly, abundantly above all we can ask or think. Congratulations, Dr. Cook, and may your labor be rewarded by seeing many apostles released in the years to come. This anthology will establish an alignment of present truths integrated by 70 authors from various regions who know as well as comprehend the Word of the Lord, the direction for the Kingdom, and the encroachment upon the Seven Mountains in God’s schematic for the 21st century. 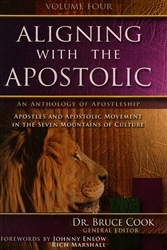 Even as Jesus drew a line in the sand to identify and dismiss religious spirits during His earthly ministry so has Apostle Dr. Bruce Cook drawn a line here to give voice to the proper role of apostles in the 21st century, t provide a platform for many new apostolic voices to be heard, and to explain how apostles must align themselves in order to align the Body of Christ . . . moving forward.